President Obama could not have been happy to have Senator Kay Hagan, the Democratic senator from North Carolina, issue a statement before his speech to the American Legion’s annual conference in Charlotte asserting that his administration had “not yet done enough to earn the lasting trust of our veterans and implement real and permanent reforms at the VA.” That was the lead-in for President Obama’s speech in front of as many as 9,000 convention attendees. For President Obama to show up in Charlotte in the wake of his administration’s VA crisis was a big step. The administration is facing a large number of unhappy veterans, especially among the largest VSOs—the 2.4 million members of the American Legion, the 2.2 million members of the Veterans of Foreign Wars, and 1.25 million members of the Disabled American Veterans—concerned about the VA crisis that led to the resignation of VA Secretary Eric Shinseki. Adding to President Obama’s difficulties, as he was delivering his speech, VA staff were leaking the conclusions of the VA Inspector General’s report that the fraudulent record-keeping and scheduling delays at the Phoenix VA hospital had not contributed to the deaths of any veterans. When the report was officially released later in the day, after the president’s speech, VA officials, including recently departed interim secretary Sloan Gibson, said that they expected the IG’s finding regarding the deaths all along—though the report was nonetheless described by CNN’s Drew Griffin and others as a “scathing” denunciation of the practices at the Phoenix VA facility. 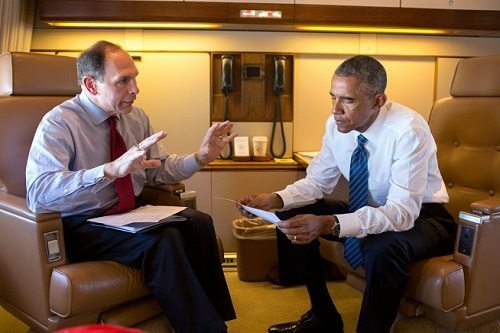 Referring to the business background of new Veterans Affairs Secretary Bob McDonald, the president affirmed that the administration is “instituting a new culture of accountability” in the department. He promised that he and McDonald would fire staff people engaged in unethical practices or cover-ups and protect whistleblowers (who have “identified a legitimate problem”) from retaliation.